Indie rockers, ABBA tribute, the Nutcracker, Movies in the Mountains and play about Revelstoke at the RPAC this fall. Sep. 7, 2016 1:00 p.m.
Ballet Victoria will perform the Nutcracker in Revelstoke on Dec. 19. From indie rockers to country music to modern dance and even a play about Revelstoke, the Revelstoke Performing Arts Centre’s 2016-17 season has its usual wide variety of offerings. The RPAC announced its schedule for the upcoming season this week. Highlights include rocker Fred Eaglesmith, indie band Great Lake Swimmers, tributes to ABBA and Johnny Cash, children’s performer Charlotte Diamond, and a Christmas performance of the Nutcracker Suite. You can buy tickets for individual shows or for a package of shows. Tickets will be sold at RevelstokeArtsCouncil.com, the Visitor Information Centre and ArtFirst. Shows are at 7:30 p.m., unless indicated. Here’s a look at what’s coming up this fall. We’ll highlight the winter performances in January. Come catch this seven piece Vancouver band pay tribute to legendary Swedish pop group ABBA. They look and sound like the original group and have played at casinos and theatres around the world. Tickets are $30 for adults and $10 for kids. Bank Session One – THE FRED EAGLESMITH TRAVELLING STEAM SHOW – John Deere from The Bank Sessions on Vimeo. With his 20th album behind him, Fred Eaglesmith hits the road with his band The Traveling Steam Show, so named because of the steampunk-ish outfits they wear on stage. The Canadian alt-country singer-songwriter plays songs about machines, vehicles, rural life, and down-and-out characters. Tickets are $25. Hailing from Shoreacres in the West Kootenays, singer-songwriter Johnny P. Johnson writes and plays songs draw from roots music, folk and Canadiana and are inspired by growing up on the prairies and living in the mountains. Tickets are $15. Indie-folk group Great Lake Swimmers blends acoustic instruments with rural soundscapes and wistful vocals. The quintet, led by Tony Dekker, is on tour promoting their fifth album A Forest of Arms. Megan Bonnell will open the show. Tickets are $25. Celebrating 35 years of performing, the Foothills Brass Quintet brings its show to Revelstoke. Their music features a wide variety of music, including seasonal favourites, classical hits, sing-alongs and humourous antics. The Revelstoke Community Band opens. Tickets are $15. Ken Lavigne, a founding member of the Canadian Tenors and tenor trio Romanza, brings his Christmas Roadshow to Revelstoke, providing a musical tour of the 1940s and the golden age of radio. He’ll be accompanied by his band and special guest Alison MacDonald. Tickets are $35 for adults and $15 for children. What is Revelstoke to you? 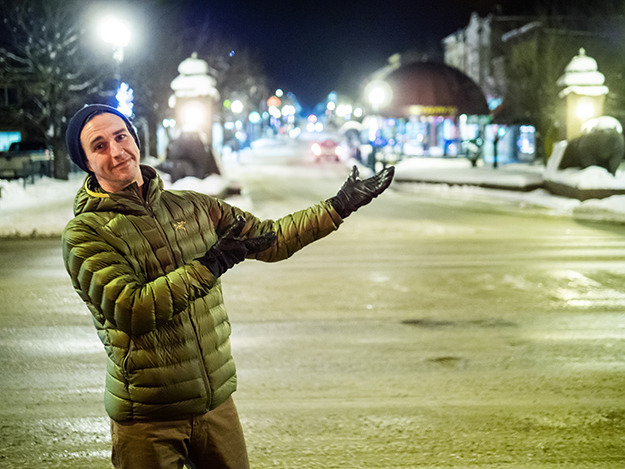 From the mill to the hill, from skis to sleds and bikes to quads, Lucas Myers (pictured) uses his talent for storytelling and observational humour to look at the many facets of life in Revelstoke. Myers met with many Revelstokians to create this original play, which was commissioned by the Revelstoke Arts Council. Tickets are available by donation. Ballet Victoria performs the Christmas classic, The Nutcracker. The show includes beautifully executed dancing, complex choreography, and a touch of humour that brings some fun to the show. Tickets are $25 for kids and $10 for adults. Saturday, October 1 at 2 p.m.
Charlotte Diamond (pictured) returns to Revelstoke for a special family show. She will perform new songs from her latest recordings, as well as favourites like Four Hugs a Day, I am a Pizza, and Octopus (Slippery Fish). Tickets are $10 for adults and $5 for children. Saturday, November 12 at 3 p.m.
Bumbershoot Theatre presents a play about Junie B.’s first day of school and the challenges she face as she tries to make new friends. The show features loveable characters and fun-filled songs based on the popular children’s books. Tickets are $10 for adults and $5 for kids. A boy growing up in Dublin during the 1980s escapes his strained family life by starting a band to impress the mysterious girl he likes. Tickets are $8. After her family attempts to sell her into marriage, a young Afghan refugee in Iran channels her frustrations and seizes her destiny through music. Grabbing the mic, she spits fiery rhymes in the face of oppressive traditions. Tickets are $8. After suffering dramatic setbacks in heir lives, three close friends, who are among the world’s best professional climbers, battle their complicated pasts, inner demons and nature’s harshest elements in an attempt to climb the Shark’s Fin on Mount Meru. Tickets are $8.